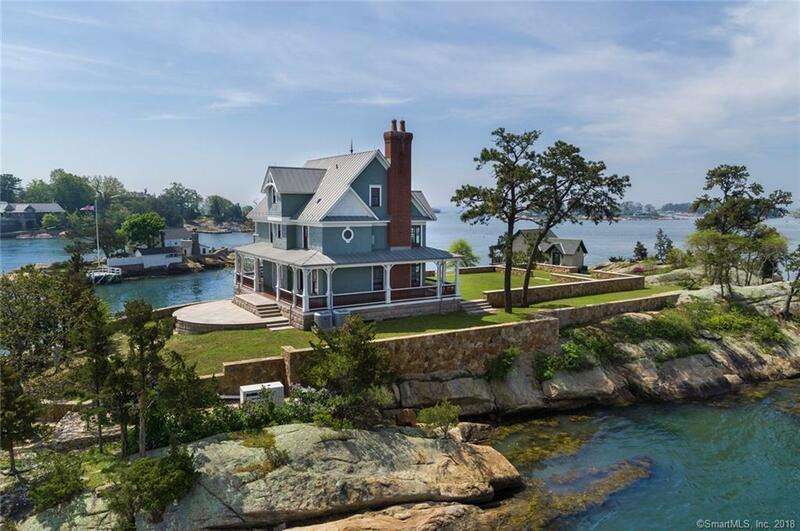 "Land Your Dream Here"Â© The Gem of the Thimble Islands, Circa 2009 12 rooms, 4-bedrooms, 3.5 bath Colonial, with a 650 SF detached Art Studio with cathedral ceilings, kitchen & full bath, which can also be enjoyed as an entertainment room or separate guest house. Built as a year-round home by one of Connecticutâs premier builders. Amenities include Deep water dock, City water, Propane heating system, Central vac, Generator & Central AC. Features wrap around mahogany porch, high ceilings, beautiful wood floors, eat in country kitchen, center island, granite counter tops, breakfast nook, bay windows to enjoy morning sunrises, dining room/den, & living room w/fireplace. Master bedroom suite with fireplace, full bath, soaking tub, separate shower, double sink. Two additional guest bedrooms and full bath complete the second floor. 3rd floor serves as a guest suite, entertainment room or fourth bedroom with full bath. Lower level walk out offers plenty of space for kayaks, paddleboards, and year-round storage. Additional space in lower level has a complete laundry room and utility room. Cut-in-Two West and Cut-in-Two East can be combined for nearly 2.0 acres of island living, which would consist of an additional classic 3-bedroom, 2 bath cottage and a detached art studio/office. Island features spectacular granite stone walls and beach. Room for pool. Possible year-round conversion. Only 19 m from the Hamptonâs across Long Island Sound. Ideal for boaters or waterfront enthusiasts.